IF YOU COULD TRAVEL BACK IN TIME WOULD IT BE POSSIBLE TO MEET YOURSELF? In the early to mid 1940s a very young American boy from a small Southern California beach town travels to India with a foster couple, ending up staying several months at or near the ashram of the venerated Indian holy man, the Bhagavan Sri Ramana Maharshi in Tiruvannamalai, south India. Prior to his departure from the U.S. the foster couple allows the boy to select one, and one only, small easy to carry toy to take with him. 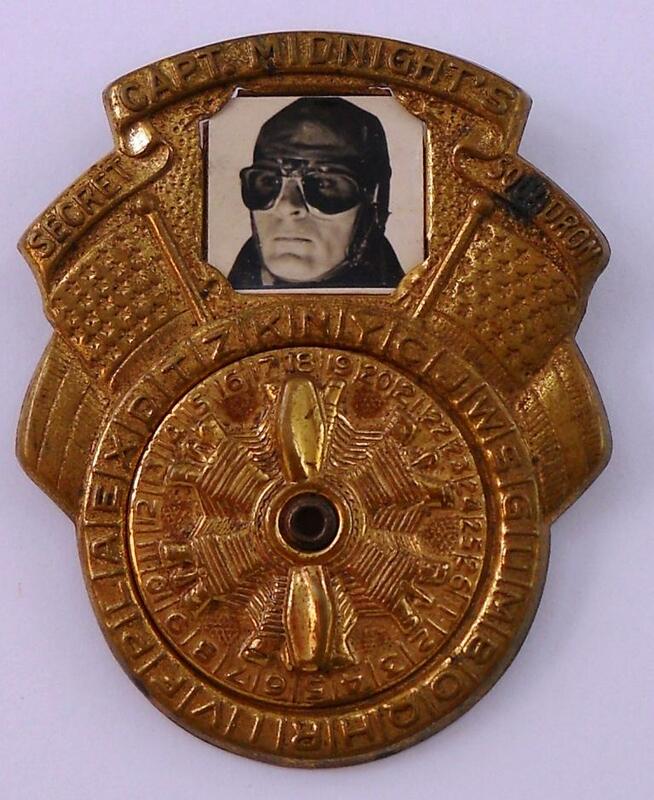 He picks his hands-down favorite, a metal decoder badge known as a Photo-Matic Code-O-Graph that has a picture of Captain Midnight mounted in it. 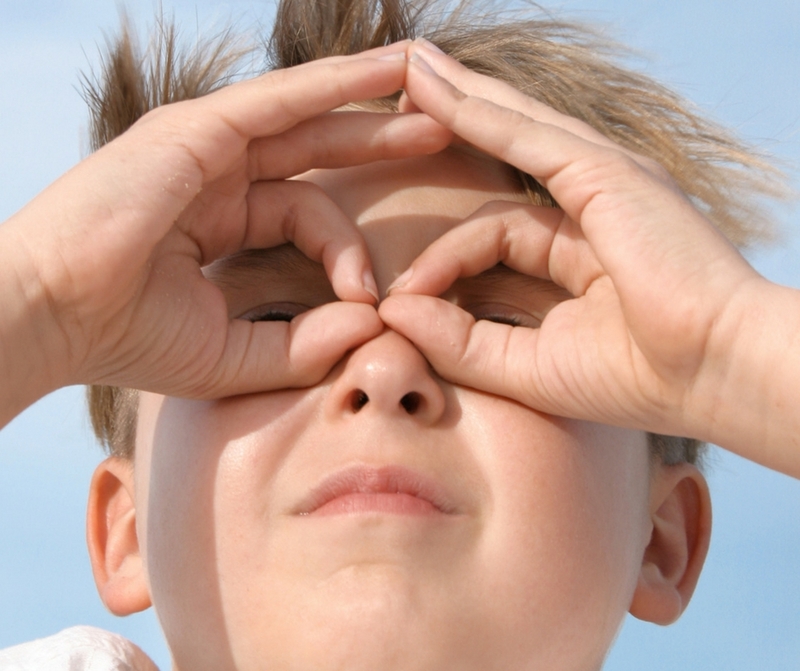 In a seeming set of incredible coincidences, an American man, who was at the time around age 25 or so, and unbelievably from the same Southern California hometown as the boy, visits the ashram during the same period the young boy is there. Oddly enough, although a full grown man, he too has a near duplicate decoder with him, albeit slightly more tarnished than the boy's decoder, that has on it's surface a somewhat newer like sheen. So too, in lieu of the Captain Midnight photo, the man's Code-O-Graph has in it's place a black-and-white photograph of himself as a young boy. 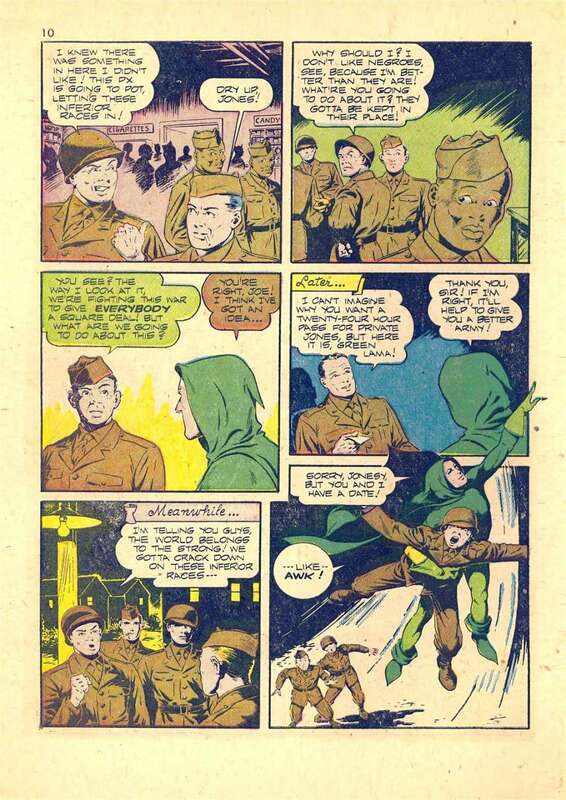 After inadvertently meeting each other and discovering they both have decoders, with the boy's permission, for reasons no longer known but seemingly valid at the time, they switch the two photos, exchanging the man's for the picture of Captain Midnight and vice versa for the boy. Not long after the man's departure from the ashram the young boy leaves as well, returning to the U.S. with the couple, ending up being left off by the couple totally unannounced at the home his grandmother on his father's side in Pennsylvania. When the boy returns to California, the decoder with the now switched picture of the boy in it, for reasons unknown, is left behind at the grandmother's and, rather than trying to return it, she simply stores it in a box where it slowly languishes away and soon forgotten. Several years later the grandmother dies and upon her death her son, who happens to be the boy's uncle, travels to her home in Pennsylvania to put her things in order. There he finds the decoder in the box among her belongings. Having been the boy's onetime guardian the uncle instantly recognizes the photo as being that of his nephew while at the same time remembering how important Code-O-Graphs were to the boy during his very early childhood years as well. So said, the uncle, knowing that the boy had stayed at his mother's for a short time during those same years, after which the decoder went missing, but now having found it, without really thinking about it sends it to his nephew. The nephew however, is now no longer a young boy but reaching into his late teenage years and just about ready to graduate from high school. The decoder, having lost both it's luster physically as well as in importance to the boy, floats around a few years eventually ending up stored away in a box at his younger brother's when the boy, now a man just into his early twenties in the 1960s, is drafted into the U.S. Army. While the boy-now-a-man is in the Army and fully vested as a soldier he requests his younger brother send him some much needed items. In the process his younger brother either inadvertently or mistakenly includes the decoder in the package along with the other items he requested. With the decoder in his possession and some distance from home he simply carries it around with him during his young adult years and has it with him when he decides to visit the ashram of the Bhagavan Sri Ramana Maharshi in Tiruvannamalai, south India. During the man's visit to the ashram, in what seems to be another set of incredible if not unbelievable coincidences, he meets a young boy from his own home town who has been staying at the ashram with a foster couple for a couple of months --- and has with him of all things, a Photo-Matic Code-O-Graph --- except that the boy's seems much newer and has a picture of Captain Midnight in it while the man's has a picture of himself when he was a young boy. Following a short discussion the man switches the picture of himself as a boy that is in his decoder for the picture of Captain Midnight that is in boy's decoder, leaving the decoder with the picture of the boy in the hands of the boy, while taking the decoder that now has the Captain Midnight photo inserted in the square with him when he leaves the ashram. 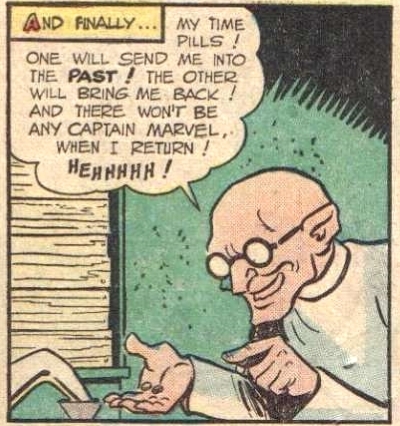 Over time he eventually returns home, continuing to have the decoder with Captain Midnight's picture in it right up to this day. Not long after the man's departure from the ashram the young boy leaves India returning to the U.S. ending up at his grandmother on his father's side in Pennsylvania. A few weeks later the boy returns to his home in California and for reasons unknown leaves the decoder with the picture of the boy at the grandmother's. She, rather than trying to return it to her grandson, simply puts it away in a darkened box where it is soon forgotten. A few years later the grandmother dies and her son goes to Pennsylvania to put her estate in order. There he finds the decoder and recognizes the photo as being that of his nephew when he was a young boy and sends it to him. The second Code-O-Graph was the "Photo-Matic" unit. 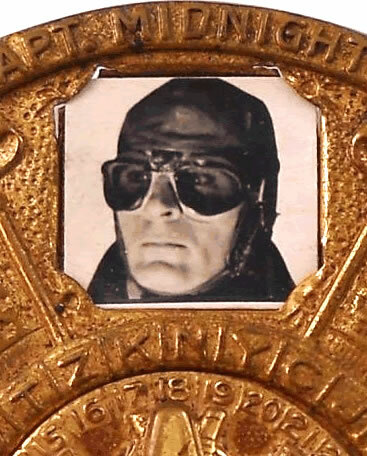 The badge had a space for a picture of the owner, to make it a photo-ID badge. The advent of World War II had an impact on the Code-O-Graph availability: the two previous models were made of brass, and the attack on Pearl Harbor, which propelled the United States into World War II, caused the U.S. Government to impose restrictions on manufacturing materials. Copper and brass were considered critical materials, and most of the materials were diverted to war activities. This precluded brass being used to manufacture novelties like radio premiums. The Photo-Matic Code-O-Graph, although not distributed until 1942, was manufactured prior to the Pearl Harbor attack. Since it, and its predecessor, were undated, the newer Code-O-Graph was used for the 1943 and 1944 seasons as well as the 1942 season, making it the Code-O-Graph with the longest service life. 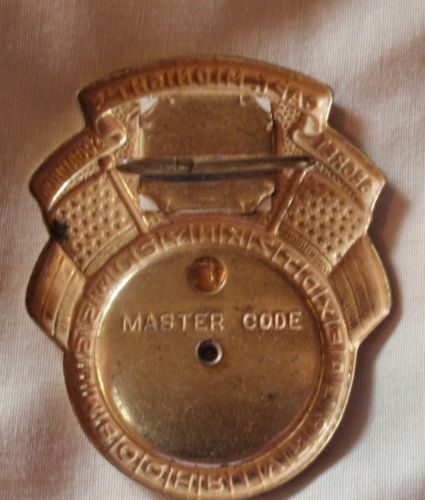 The cipher setting scheme was similar to the 1941 Mystery Dial model, but there was only one cipher setting window, labeled "Master Code." The word season used in context here refers to the radio broadcast season --- that is, when the Captain Midnight radio program started with and continued with all new programs for a given period of time before starting with another whole series of new programing. "Without knowing it, apparently as I fiddled with the decoder while walking, the pin became unhooked. In the bending down motion to position myself on the low wall next to the boy the sharp point of the pin went right through the thin material of my pocket and directly into my leg just as I was finishing sitting down, jabbing me with a sharp jolt of pain through the upper front of my thigh." but the action in the past was explicitly caused by the action in the future." The Bootstrap Paradox as it is so called, is a time-travel paradox wherein an object or information can exist without ever seeming to have been created. The object or piece of information in the future is taken back in time where, through the normal passage of time from the past to the future, it is retrieved to become the very object or piece of information that was brought back in the beginning. 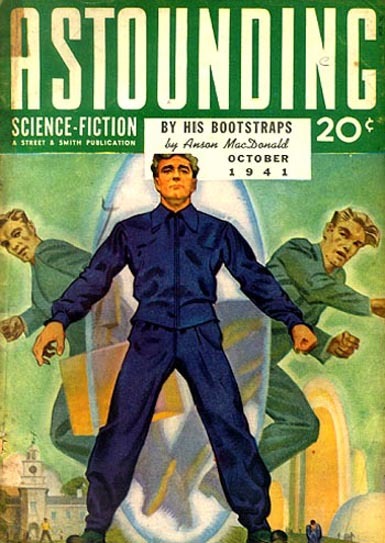 The term originates from the expression "pulling yourself up by your bootstraps" and was used to describe the time-travel paradox in Robert A. Heinlein's short story, written under the pseudonym Anson MacDonald, titled "By His Bootstraps" that was originally published in the October 1941 issue of Astounding Science Fiction. The main character in Heinlein's story, Bob Wilson, recreates, that is, copies the contents of a notebook belonging to his future self. At the end of the story, he wonders who actually compiled the notebook as he hands over the book to his younger self in the past, the same book his future self gave him to copy in the first place. "In the first incident he saw the boy as a boy. In the second incident he saw the boy as a man --- even though the seeing of both was at the same time, same place, and same time period." Although such things as I have put forward regarding the young boy and the man at the ashram as having transpired, AND that did in fact transpire in real life and in the real world, how is it that they were actually able to transpire? The above quote stating "his mental barriers were reduced to nothingness" with the "HIS" in the quote making reference to me, the Wanderling, is found in FACE TO FACE WITH SRI RAMANA MAHARSHI, Enchanting and Uplifting Reminiscences of 202 Persons (2009) as compiled by Laxmi Narain and available at the link below so sourced --- with the quote segment from Number 179 provided thru the written observations of Sri C.R. 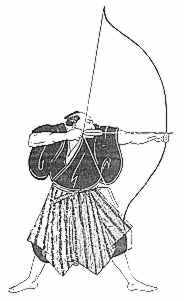 Rajamani. "(T)he American entered without announcing his name. From the moment he entered, Bhagavan's gaze was on him. He sat before Bhagavan for three hours. Some kind of communication was going on between them during this time. There was such deep silence; no words were exchanged. The American got up and left. He never came back." There is a tendency for many people to not only confuse, but also intermingle both of those two main quotes that I cite so often: the one at the top of the footnote about the face-to-face meeting with Ramana and the one found immediately above about the American entering the ashram without announcing his name. The problem arises because not only do I quote both of them close together or in conjunction with each other throughout what I write that they get intermingled, but also because, even though they are by two separate authors in two separate books writing about two separate incidents, they are talking about the exact same person as well as the exact same time at the ashram with Sri Ramana. The difference between the two is that in the first incident Ramana saw the boy as a boy. In the second incident he saw the boy as a man --- even though the seeing of both was at the same time, same place, and same time period. The answer, or non-answer as the case may be, still lingers then in the form of the original question regarding the boy and the man. How did what has been put forward as having transpired actually have been able to transpire? For one thing the Ramana Ashram isn't just anywhere. It is located at the foot of the Holy Hill Arunachala just below the caves Sri Ramana Maharshi lived in for so long. The reason Arunachala is considered to be so sacred and the holiest of the holy and why Ramana as well as so many others have been drawn to its slopes is intertwined with the fact that the chronological age of the hill itself, geologically-speaking, dates back into ancient, ancient times --- thousands of years older than the Himalayas and way before man ever tread foot on the surface of the Earth, in a sense making the foothills and the ground the ashram is built on imbued with a deep and sacred meaning, infused with magic and blessed by spiritual timelessness. As you can see in what is being presented here there is a two-fold set of phenomenon going on. One is what transpired at the Ramana ashram in India with the young boy and the Code-O-Graph under the auspices of the Maharshi and the second, circulating around what transpired between the Zen Master and the man in the monastery located high in the Himalayas located somewhere along the southern edge of the Qinghai-Tibet plateau. That man, me, through a strange or unique combination of events put into place and implemented somehow through the powers of the Zen master, ended up with me no longer at the monastery, but at the Ramana ashram located along the base of the holy hill Arunachala, Tiruvannamalai, south India, after which I then met the young boy. "It is after passing through the forward walls of the ruins and finding a fully functional monastery on the other side of the doors that people start getting befuddled. If they don't totally dismiss what is being said, they lose the ability to grasp the concept. Once through the main portal the time associated within the walls of the monastery and the land beyond flowed like the surface of a Mobius Strip, non-orientable." As so stated, time associated within the walls of the monastery and the land beyond flowed like the surface of a Mobius Strip, non-orientable. 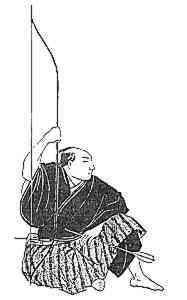 When the Zen master put into place his intentions, he did so from a non-orientable time environment --- meaning, because of conditions, when and where he was within that non-orientable time environment relative to the conditions, would determine the outcome or results of his efforts --- in effect making his Siddhi efforts different in implementation and outcome than they would by if put into place on the other side of the walls. The target for his efforts were another time and another place, more specifically the Ramana ashram, itself, as previously discussed, imbued with it's own deep and sacred meaning, infused with magic and blessed by spiritual timelessness. "Did showing up at the ashram in the past affect or change the future, and if so, how?" There are two things that I am knowledgeable about in answer to such queries. First, it has been well established that the Photo-matic Code-O-Graph had a photo of me as a young boy mounted in the square of the decoder when I arrived at the ashram with the foster couple and continued to have the same picture in it many years later when it was sent to me by my brother while I was in the Army. What that means is that when I was selected to live with the foster couple while my mother was still alive, but too ill to care for me, the Code-O-Graph I took along and that ended up in India, clearly had a photo of me as a young boy installed in the square. Under my auspices, as far as my memory was concerned, the Code-O-Graph should have continued to have that very same picture of me as a boy in it all the way up to me reaching young adulthood and being drafted into the military, a period of time that encompassed me from just starting school for the very first time clear through to graduation from high school and going into the Army. And it did. 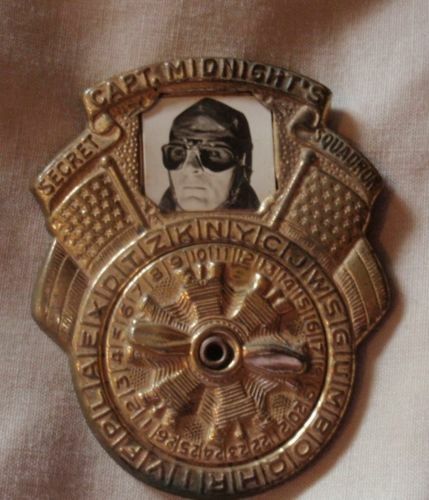 It was only after meeting the boy in the ashram and exchanging photos that the badge I had with me as an adult and left the ashram with no longer had a picture of a young boy in it, but instead clearly had a picture of Captain Midnight mounted in the square, and clearly so, has that same picture of Captain Midnight in it right up to this day. Secondly, the Zen master's intent, as I have extrapolated it in hindsight, was for me to bypass any potentially powerful Mara induced impediments by coming in on the side of time in front of them, that is before they happened. Thus in a sense, after which returning into the present forward, maintaining in place any "mental barriers that had been reduced to nothingness" before the impediments were set into motion. 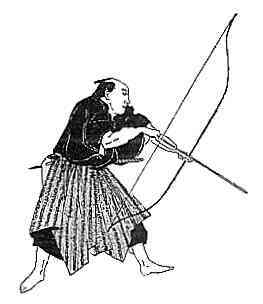 As events seemed to unfold in my life such does not seem to be the case, that is, the Zen master missed his mark. What is being expressed by my view that the Zen master in his efforts to place me in the ashram "missed his mark," is that his efforts either fell into place BEFORE the young boy's "mental barriers had been reduced to nothingness," or the Zen master's efforts landed me in the ashram AFTER the Mara induced impediments had already been put into place and operative. If you remember, my mental barriers being "reduced to nothingness" occurred during my early childhood years when I was around six years of age, and done so under the personal grace and light of Sri Ramana himself. The so-called "Mara induced impediments" occurred a few months later after I returned to the states, totally intertwined, inseparable, or possibly even caused by a period I was struggling with following the death of my mother and the dissolving of my family. In equal stature, added to the previous, was me being separated by the growing time and distance from the spiritual penumbra of Ramana's umbrella of grace. Even so, regardless of the impact of the two, between "the reduced to nothingness" and "Mara's impediments," there was in time, for me as a young boy, a narrow gap where an unimpeded wide-open window of Enlightenment existed. Following my return from India during the period of the gap, but prior to it dissipating to such a point it no longer existed, I ended up staying with my grandmother. She, knowing my personality before I left for India and knowing me after I returned, became concerned with what she considered a seemingly askew perspective on things. She said I kept saying things like I could see but that there was no me, that it seemed like the whole back of my head was gone but I could still feel it, that I was both dirt and sky. In turn, because of her concerns, she contacted my uncle to see if he had any idea where my father was. Almost immediately my uncle came out to assist, the first of several trips before he actually remained on a permanent basis. Even though my uncle was not worried about my behavior at nearly the same level as my grandmother seemed to be, he agreed her concerns carried a certain high amount of validity. He was aware I had been to India, but at that moment in time he had no idea I had been in the presence of a prominent Indian holy man. Even so, through pure gut intuition and a long time running association with Native American spiritual elders of the desert southwest, he felt my behavior carried a deep ring of spirituality to it. He searched around for someone who might have answers and in the process came across Paramahansa Yogananda of the Self-Realization Fellowship. Because of my grandmother's concerns and my so-called askew perspective on things my uncle took me to see Yogananda, not because he knew him or was familiar with his works, but because he was one of two high profile personalities in the India-based eastern spiritual movement that had taken root on the west coast during and following World War II. When the so-called "Mara induced impediments" were put into place it was only done so some months after the "reduced to nothingness" incident, that is, after I returned to the states, meaning of course I was still a young boy, not an adult. How is it then when the situation manifested itself between the Zen master and myself he chose transferring me from the ethereal location in time and place within the monastery to the ashram --- all the while maintaining the same age of the grown man that I was after having reached that age by going through all that encompassed what I experienced reaching that grown-up-maness from my childhood? In the case of me, if I as a grown man had been placed into the ashram environment during the same period of time the boy was there but BEFORE his mental barriers were reduced to nothingness, upon my return I would not have known, seen, experienced, or even been aware that I as a young boy sitting before the Maharshi had reached a point where my "mental barriers had been reduced to nothingness." After sitting before the Maharshi as a young boy I should have gone through the whole rest of my life reaching the stage of being a full-fledged adult, Awakened, Enlightened the same as the ancient classical masters. Instead, from my childhood to when the Zen master returned me to the ashram as an adult, because of the mitigating circumstances as alluded to in The Last American Darshan, I knew nothing of it. However, Ramana, having seen me at the same time in both situations, knowing me when a boy as Enlightened, but me as a man NOT Enlightened, and as found in THE MEETING: An Untold Story of Sri Ramana, the Maharshi interceded at the stage stop to resurrect the loss. If I had seen the young boy in a state of having been "reduced to nothingness," yet, as an adult not aware of ever experiencing such a state nor had I ever recalled it from my youth to a grown man, I would have interceded in some fashion to ensure growing to manhood it wasn't lost. The easiest way for that to have transpired would to have somehow eliminated the one, primary specific incident that was most directly responsible. If I could have figured out that specific incident on the spot in the ashram at the time or not is another thing. However, looking back, that one specific incident would be to ensure the boy knew, no matter what, under NO or any circumstances, was he to get out of the car and open the garage door before his aunt stopped the car and she herself got out. Even IF the Zen master's efforts or Ramana's attempt at the stage stop two years later would have been successful in their execution, unless I would have interceded with the boy at the ashram in some fashion, there still would have remained --- from me being a young boy of around age six through to me being a man of roughly age 26 --- approximately a 20 year plus-or-minus period where the "reduced to nothingness" phenomenon would have been veiled, the same passage of time as if nothing had been done. It wasn't until the events of Dark Luminosity that things were ultimately resolved, and even then they seemed to bubble up within the normal flow of the time stream. Any shift in any fashion in the conditions up or down or across the stream relative to the cause will impact the resultant outcome of that cause. 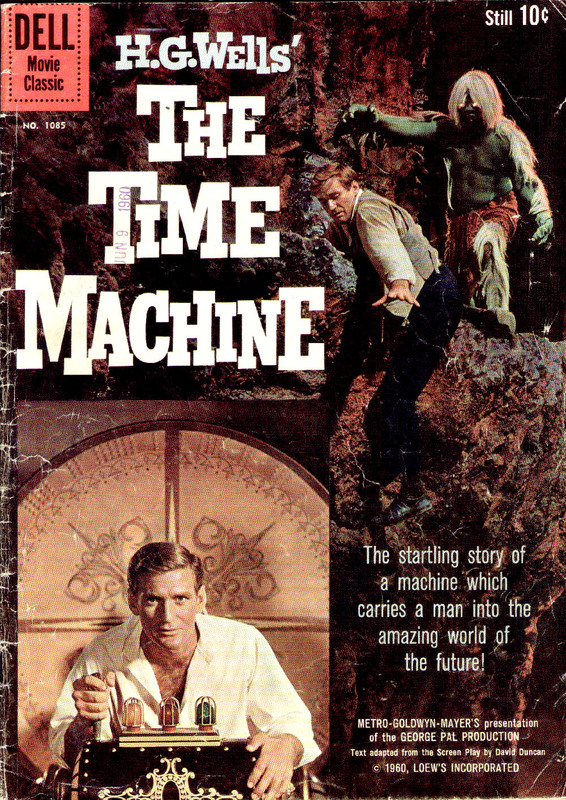 Additional time-travel possibilities and outcomes related to meeting yourself as well as how doing so relates back to the specific case outlined in the main text above, including a couple of videos from the 1960s TV series Twilight Zone. The Twilight Zone is a virtual goldmine of time travel stories, almost always with a twist or paradox. There are two standout episodes that are highly intriguing, both of which are deeply infused with time-like paradoxes. 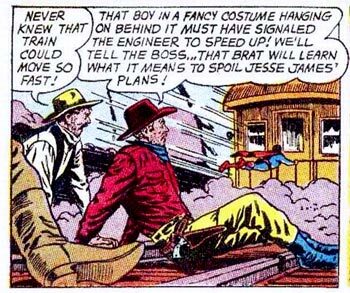 Of real interest with each is that neither of the two main characters in either of the two stories use any sort of a mechanical device such as a time machine or high-energy portal or similar such contrivance to be transported into or back from the past or future. They simply "walk" into or out of it not to dissimilar to the main character in the main text above. The first episode oddly enough is titled Walking Distance wherein a man on a present-day road trip stops to get gas and have his car serviced. While the service is being done he walks to a small town a mile or so away he was raised in. After he arrives he discovers there has been no changes or anything, the town having remained almost exactly the same as he remembered when he was a kid. At about the 8 minute 13 second mark into the video the man sees a small boy carving his name into a post of the town square gazebo and remembers doing the same thing when he was kid. 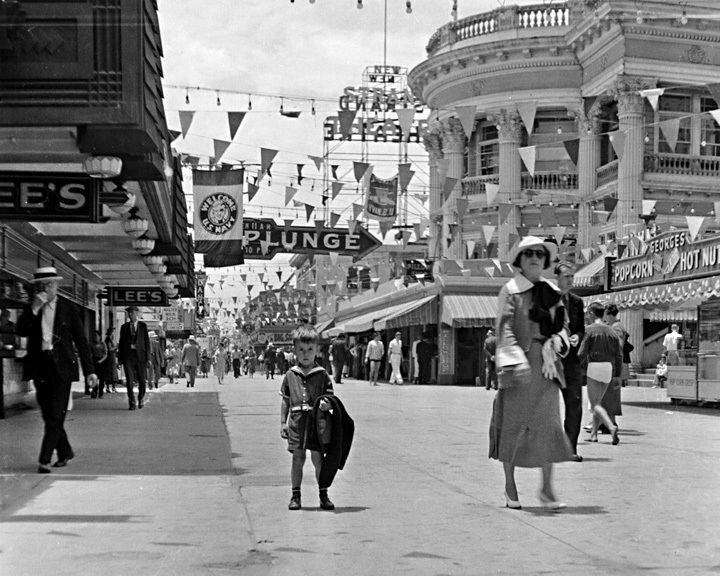 Later the man tries to talk to the boy as he is riding a carousel located in the same town square as the gazebo. When he does the boy runs, falling off the merry-go-round injuring his leg when it gets caught under the turning floorboards. After that the man walks with a slight limp. The second very excellent Twilight Zone episode is titled A Hundred Yards Over The Rim a right up the alley Bootstrap Paradox story. In 1847 a pioneer from a wagon train sets off to find medicine for his ill son. 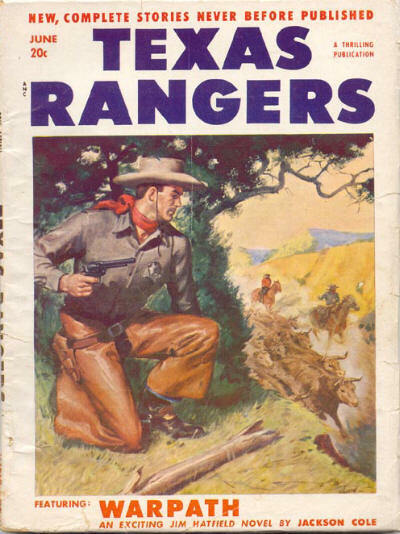 Somehow he crosses in time over into present day New Mexico, the medicine he needs and goes back to the wagon train. His son is cured and grows up and discovers the medicine that cured him. If you haven't gone to Footnote  yet you should really do so as it has as well links to both Footnote  and . TRAVELING IN TIME: BRINGING YOURSELF BACK, OR NOT! "(There were) piles of various black and white photos of every size and shape of my family taken during the period of time when my brothers and I were kids, all the photos except possibly a minor few were taken prior to my mother's death, and for sure none of us three kids together after her death. "However, and this is one of the biggest howevers ever, and why all of the above is relevant: In what appeared to be a series of consecutively taken photographs, all seemingly done at the same time and at the same location, there were four that clearly showed the three of us kids standing behind a dark colored 1939 Plymouth four door sedan, with my older brother standing on the ground and my younger brother and I on the rear bumper. "The photos were taken at what looked to be a railroad yard of a train station or possibly a dock or pier of some sort. The car in the photos was identified as having belonged to my grandmother from before the war years up to at least 1950, something both my younger brother and I clearly remembered. Among that series of four photographs was one that was a head-and-shoulder close-up of just my younger brother and myself, of which where the picture of my face should have been, was instead a hole. Actually a carefully cut away square hole, as if done so by an extremely steady hand using an ultra sharp razor blade or an x-acto knife. "All the time I was at my brother's that photo kept gnawing away at me. What would be the use of a picture of my face being cut out, especially so no matter how neat it was done, would still ruin the rest of the photo. Then it dinged. I went back through the photos until I found it, then using the inside edges of the cut out opening as a template drew the square on a piece of paper. When I returned home I matched the square I drew with the size required to fit snugly into the opening of my Photo-Matic Code-O-Graph. The size matched perfectly. Although I left the photo that had my face cut out at my brother's with the rest of the photos, on the back of one of the series of four, in cursive writing, most likely in my mother's or grandmother's hand and using fountain pen ink, was the first names of my two brothers and myself along with the words 'Union Station' and the date 1942-43." If it is taken that somehow the above is directly related to the events so described in the main text as well as the Bootstrap Paradox, a problem arises on two fronts. One, other than being the correct person, that is, me as a boy, and the correct time in the overall scheme of things, 1942-43, as well as the exact size and shape of the hole in the alleged photograph being a perfect size to be inserted into a Photo-Matic Code-O-Graph, there is no hard proof that the cut-out headshot was ever the actual photo that was in the aforementioned decoder badge --- or any other Photo-Matic for that fact. Secondly, even if it was the exact same photo, the question is, how and when could it have found it's way into the time stream we are talking about here? The following quote is from the main text of the aforementioned The Code Maker, The Zen Maker. The quote pretty much makes clear that my mother, prior to her death or the coming on of her full-blown illness, had unfettered access to "my" Photo-Matic Code-O-Graph as well as it would seem by inference, because of what appears to be her handwriting on the back of the photos, to the series of 1942-1943 Union Station photographs of which the picture of my face was carefully cut out. 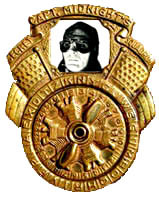 "(W)hen I was a young boy growing up, those who were close remembered well when I received my first Captain Midnight decoder badge. It was a Photo-Matic Code-O-Graph I sort of misappropriated from my older brother. 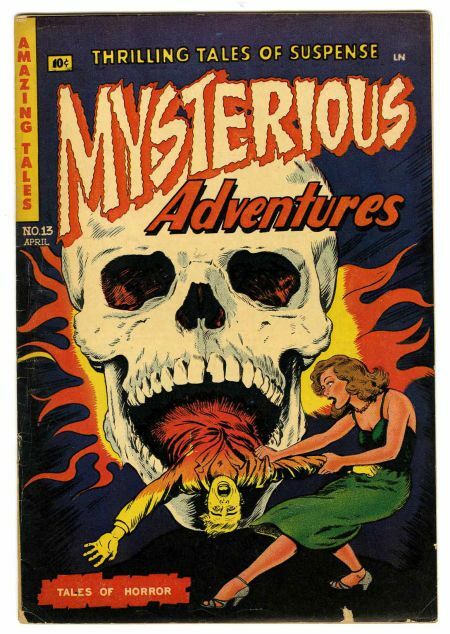 I did so first without his knowledge, then without his approval, leaving him stuck with the old previous model, albeit the first in the series, a 1941 Mystery Dial Code-O-Graph. Once I got my hands on the Photo-Matic, not only would I not give it up, for years afterwards hardly anyone ever saw me without it. 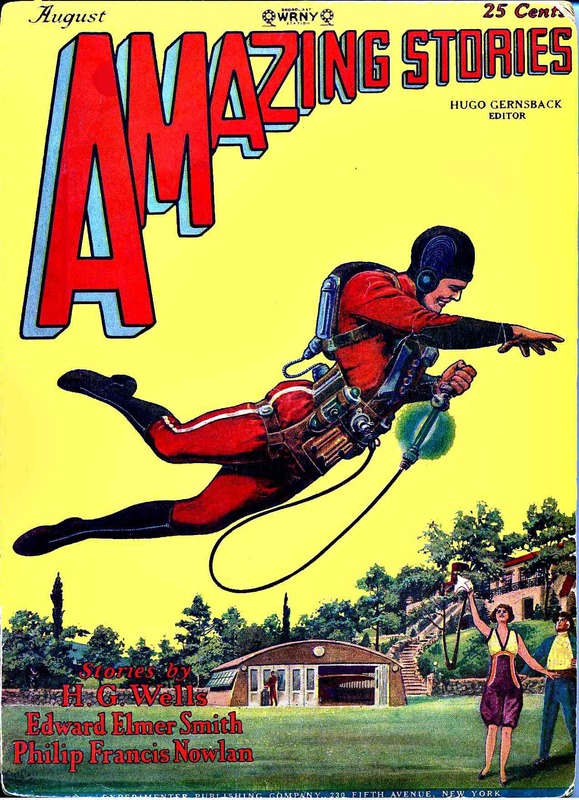 They say me listening to Captain Midnight and deciphering his Secret Squadron messages all the while coveting the decoder for myself raised a huge inter-sibling calamity and fuss in the family. But my mother, seeing that using the decoder required dealing with letters and numbers, and me willingly learning them at such an early age, bought a bunch of Ovaltine and sent for another decoder so both my brother and I would have one. The recognition of the importance and the learning aspect of it all is one of the few fond memories I have of my mother prior to her death a couple of years later --- and of which, along with the addition of the extended life of the Photo-Matic decoder through to the end of the war --- had a major impact on the importance of decoders on me starting so early in my life. As for the second decoder, the one ordered by my mother for my older brother, no sooner had he obtained it than he lost interest, eventually surgically disassembling it into as many pieces as he could. The last I saw anything of it, the main body of his decoder had been smashed totally flat after having been run over by my dad backing the car out of the driveway." So said then, implied or actual, if taken for granted that the events transpired in real life and seemingly on the conventional plain at all times relative to the protagonist, there seems to be no explanation other than the concepts so imbued within the boundaries of the Bootstrap Paradox. The above quote as the source so shows comes from Footnote  of Guy Hague who I met while I was a teenager in high school and told me what happened. Hague was the same man that knew my dad from the shipyards and had stepped up from the crowd that day to assist the medium. What I take from the story is, in that when the medium made finger goggles using her hands and fingers and put them around her eyes, she was actually mimicking what she saw in the photo in the decoder --- a picture of Captain Midnight wearing goggles --- and all done so while my mother was still alive and before I ever went to India taking the decoder with me. 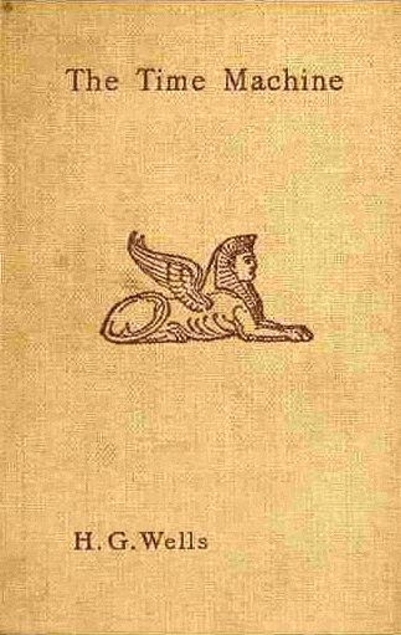 "Not long after my father died than his then wife, who disliked both my older brother and me with a certain amount of way over-the-top high passion intensity, completely bypassing or overlooking the two of us, called my younger brother and told him she had a whole bunch of boxes containing belongings of our father related to his early years that she found stored away, and if my brother was interested, to come by and pick them up before she had them all carted off to the dump or tossed into the trash. "Before moving the boxes out of the storage unit they were located my brother started going through some of them, but stopped after only a few because the woman my dad was married to at the time, at first, made him open them one by one watching every move he made and making sure nothing was in any of them that was of her concern. Instead, my brother balking at her nasty demeanor, just took all the boxes and stored them away in a conex container on his property with tons of other stuff thinking he would go through them some day. He did know that in at least one of the boxes he unsealed there was a lot of old photos of our family and mother that our father had, upon her death back in the mid 1940s, simply taped up and secreted away. To my brother's knowledge the inside content of the boxes hadn't been seen or gone through by anybody since, and for sure, until we saw them, neither my brother nor I knew they existed. It was within that same box of photos that I found the one with the square cut out with the date 1942-43." In a sort of Schrodinger's Cat paradox, basically what is being said is, that almost immediately after my mother's death my father gathered up everything related to her and us three boys, including the box of photographs which he apparently sealed closed by taping it up, then put it all into storage. There the box and the photographs remained untouched to anybody's knowledge until my brother found it and opened it following our father's death. "A living cat is placed into an opaque box-like steel chamber. In the chamber is a very small amount of hydrocyanic acid, a radioactive substance. If even a single atom of the substance decays during the test period, a relay mechanism will trip a hammer, which will, in turn, break the vial and kill the cat. "An outside observer cannot know whether or not an atom of the substance has decayed, and consequently, cannot know whether the vial has been broken, the hydrocyanic acid released, and the cat killed. Since it is not possible to know with any amount of certainty according to quantum law, the cat is both dead and alive, in what is called a superposition of states. It is only when the box is opened and learn the condition of the cat that the superposition is lost, and the cat becomes one or the other, dead or alive." Although as a young boy I never lived in the downtown area of Los Angeles I did grow up in the suburbs as well as the 20 mile away beach towns and the even further away farm and ranch areas that surrounded the city in those days. 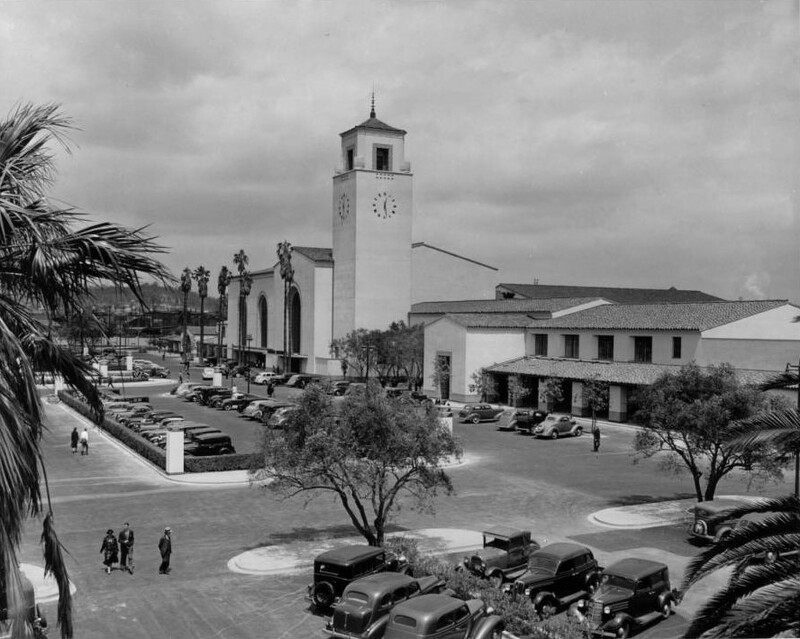 Unlike now, during those same growing up years, traveling by train was big, with the main railroad terminal in Los Angeles being Union Station, a place that figured large in my life on several occasions. Again, in the previously mentioned Footnote  in The Code Maker, The Zen Maker I wrote about how a series of four black and white photographs of my brothers and me figured prominently in my life. On the back of one of the photos of the series of four, in cursive writing, most likely in my mother's or grandmother's hand and using fountain pen ink, was the first names of my two brothers and myself along with the words 'Union Station' with the date 1942-43 which is the first time and earliest date and year I can confirm being at Union Station, the next being July of 1944. About five years later, following the death of my mother and by then living with my Stepmother, I met an elderly (to me) Chinese man that washed dishes and swamped a bar not far from where I lived. During slow times he used to meditate in the alley near the back door of the bar. The two of us met while I was traveling with a couple of kid-friends from school collecting and turning in beer and pop bottles for the deposit. One day I came by without my friends and he asked why I was traveling without my buddies. 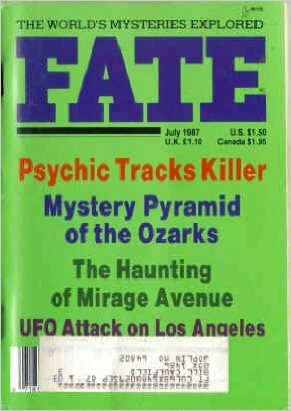 "A couple of days later I was at Union Station in Los Angeles with my stepmother who was either meeting someone or seeing someone off. I was on the platform some distance behind dawdling along when out of nowhere, using one of my newly learned words, I said, 'Woo, woo, here goes the (explicative)-train,' using the same N-word my godfather had used. The next thing I knew a Redcap was bending over with his face in mine, grabbing my shirt around the collar at the neck with one hand and waving the index finger of his other hand inches from my nose and loudly saying, 'Don't you ever use that word again!' Having never been grabbed like that before, by a black man or otherwise, I was scared shitless. Before I could respond in any fashion my stepmother was on the scene with her bodyguard asking what was going on. The Redcap, recognizing who my stepmother was, quickly reinstituted his Redcap role and using her first name by prefacing it beforehand with Lady almost as if she was royalty, related what happened. It was easy to tell my stepmother was totally aghast, fully unable to believe I would use such a word and insisted I apologize immediately not only to the Redcap but to all within earshot. She scribbled something on the back of her business card and handing it to the Redcap thanked him for what he had done telling him if there was ever anything in her power she could help him with, to call. Back in the car she demanded to know where I was learning such words. I told her what my godfather had said. Not long after that, under my stepmother's request, he was gone." 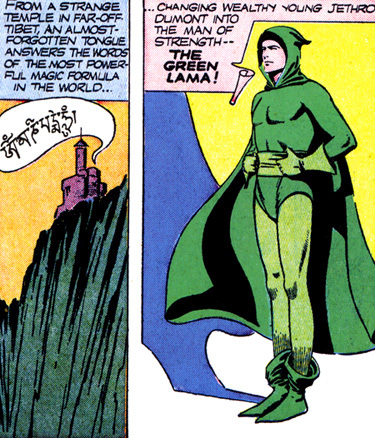 The Green Lama was a 1940s superhero. Sporting an everyday guise as Jethro Dumont, a rich New York City resident and man about town, if necessity demanded it and he recited the Jewel in the Lotus Mantra "Om Mani Padme Hum", Dumont underwent a startling and dramatic change, becoming the Green Lama, gaining super strength, invulnerability, and the ability to fly. As a very young boy, after the death of my mother, following a series of events that for me were both fortunate and unfortunate and of which are fully articulated in M.V. Tulagi and elsewhere, I was left off alone and totally unannounced at my grandmother's on my father's side in Pennsylvania --- a grandmother I had never met nor ever even heard of. 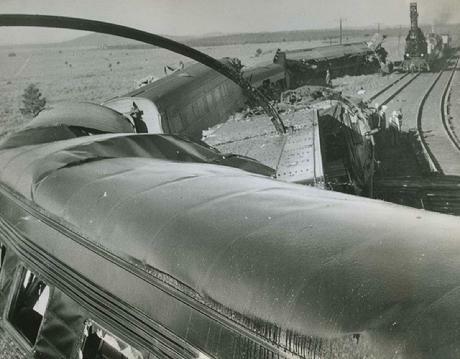 Although I was unhurt, the person or people I was traveling with was among the injured and taken, with me along with them, to either Williams or Flagstaff. Because of the nature of their injuries, whoever I was traveling with was held-up under doctors care for several days, leaving me without direct adult supervision. My grandmother, who had been contacted by the railroad, called my uncle in Santa Fe. He inturn contacted a nearby tribal spiritual elder to oversee me until he was able personally to intercede and safely get me to Los Angeles Union Station and thus then, to my grandmother's home in California. The events found in this footnote has also been presented by me in virtually the same manner and same form in any number of my other works. What I have not included in the above account or have not revealed previously is a part of the crash event that circulates around the somewhat mysterious tribal spiritual elder my uncle arranged for me to be watched by until he, my uncle, could catch up with me. As you may recall, after the wreck, because the adult or adults I was traveling with had been hospitalized, I was left without adult supervision. I write about sitting in the waiting room late at night in some train station out in the middle of Arizona with the tribal spiritual elder waiting for my uncle to come get me. 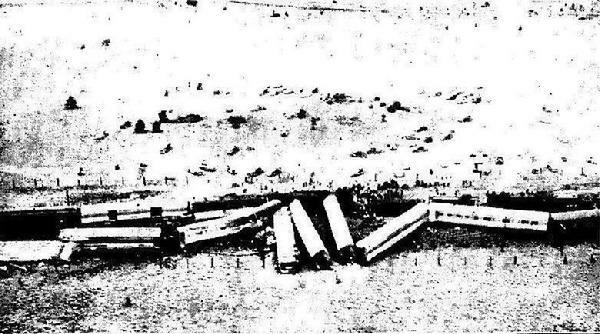 "Mid-evening on the night of the-unknown-to-anybody at the time up-coming crash I had gone to bed in the bunk in my compartment and as far as I knew had fallen fast asleep. Sometime during that period between the time I fell asleep and the crash occurred I found myself neither asleep nor in my bunk but outside of the train standing barefoot on the desert floor in the middle of the night in my PJs some distance off from a set of railroad tracks, my hand being held by an elderly Native American man. 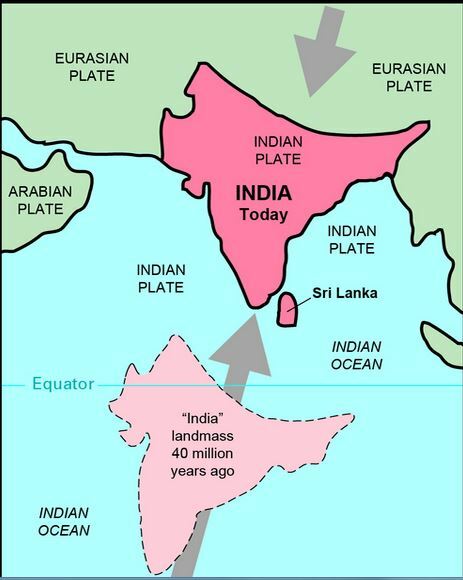 The lower portion of the graphic below shows the location of the India landmass 70 million years ago --- 5 million years before the demise of the dinosaurs as so aptly discussed by me in The Mayan Shaman and Chicxulub. 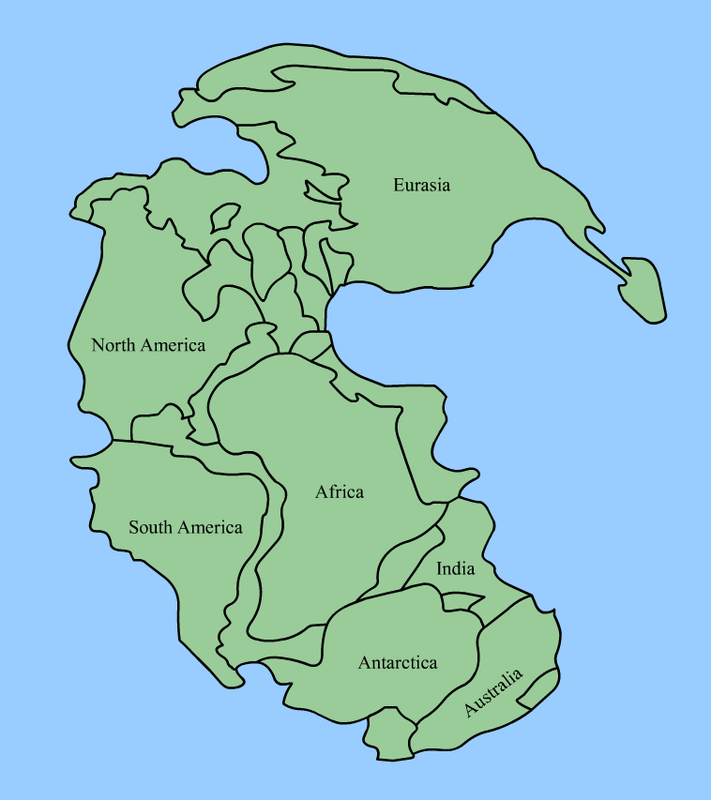 Returning, the middle of the below graphic shows the location of the same landmass 20 million years later, i.e, 50 million years ago, having moved north and crossed into and partway through the equator. The top of the graphic depicts India's present location having connected fully into the Eurasian continental land mass. 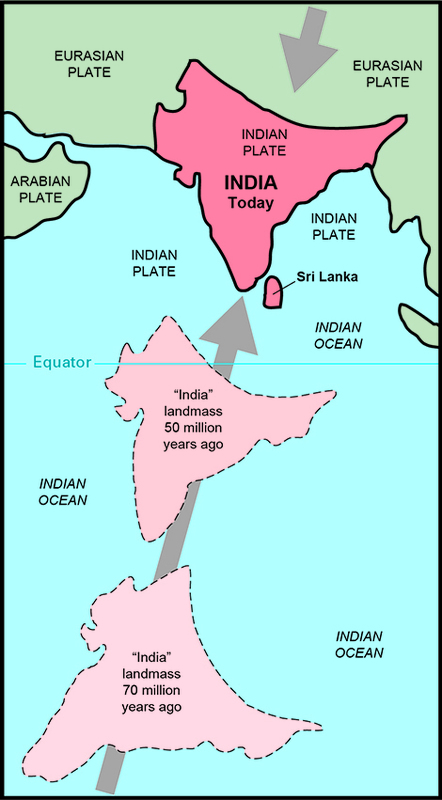 As you can see, throughout all those million of years that the sub-continent moved north it stayed virtually intact and unchanged --- all the while carrying the mountain range that contained that which would eventually come to be called Arunachala, except for typical wear and tear that might occur through normal weather and geologic processes, along with it. 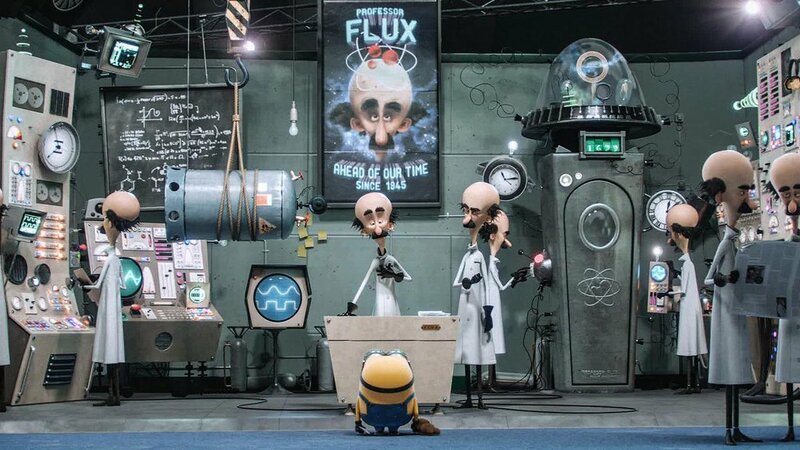 The above graphic shows a scene from a Minion movie. 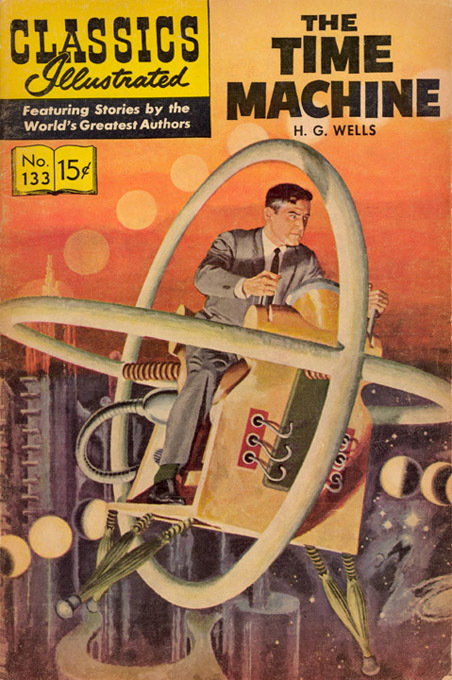 In the graphic, on the far left standing in front of some sort of an upright computer like machine is Professor Flux. 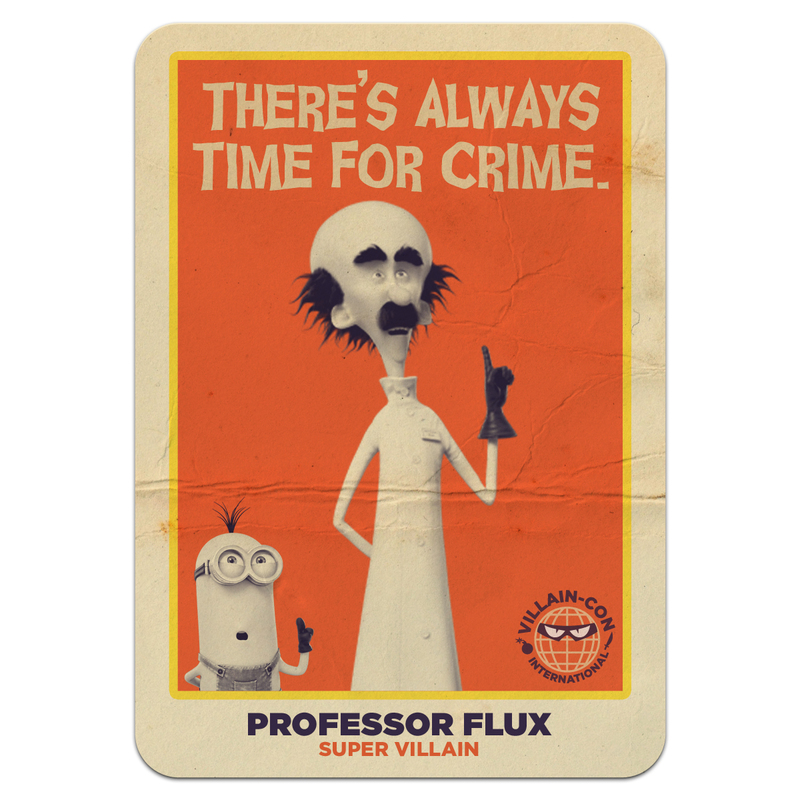 Appearing in the same room is what appears to be an additional six other Professor Flux'es. On the right of the graphic is an upright device that has a door with a round window. That device is described in the movie as being a time machine. According to the story line, of the total seven Professor Flux'es the one on the far left is the "original," the others having been brought back from the past via the time machine to help him --- in essence setting up a scenario where not only does the time traveler meet himself, he meets multiple numbers of himself and as well, brings them back with him to his present. In the movie the original, "real" or "first" Professor Flux is accidently hit on the head by the suspended cylinder directly behind him, collapsing to the floor dead. With the onset of the sudden demise of the original Flux, who had gone back in time and brought each of the himself's back with him one by one, the other Flux'es start disappearing one by one. However, taken as it is, any physical place in time that Flux went back into the time stream and took himself he would no longer exist from that point forward in order to make it to being in the present (i.e., the "present" being the lab and all seven Flux'es together). So, if Flux would have taken himself out of the time stream ahead of the lab scene he would not have been there all along in the stream to do whatever he did to get to the point that he could go back in time to get himself. If such was the case then, he wouldn't have been there to go back to get himself. So too, since all seven were in the lab together at the same time, it appears he had not, prior to his death, reinserted each of the himselve's back into their initial time frame to be able then to have come forward. Notice too, all the Flux'es appear to be in and around or near the same age. Although he could have picked himself one-by-one from the near future by backing up in time each time before he took one, none of them appear to be older than any of the others, indicating not pulling himself any distance in time out of the far future. Him being killed after he got them, however, would not impact them being there when he died. What would be impacted would be all the remaining Flux'es moving forward in time together as they each met themselves prior to the time they were taken back. If you click the above graphic it will take you to a YouTube video showing the specific segment from the movie as so cited. "(U)nknown to me, my mother was no longer at home, having become totally unable to care for herself, so much so my dad placed her into a full care sanatorium-like hospital in Santa Barbara, California on an around the clock basis. Before my dad had a chance to respond to the couple, the couple, knowing full well that my mother was in a sanatorium, without my father's grace, took me to India, simply sending him a note saying that in the end I had changed my mind about going. While I was gone my mother died. I missed the funeral and by the time I got back my family had disintegrated, my two brothers and myself all going separate ways, my dad disappearing into the countryside heavy into alcohol." "There had to be in existence two of me at the same time, albeit occupying separate spaces. One of me quite possibly knowing my mother died, the other still having a mother alive."